The King Store and King Home Museum are open for short tours on the second Sunday of each month from 1-4 pm. 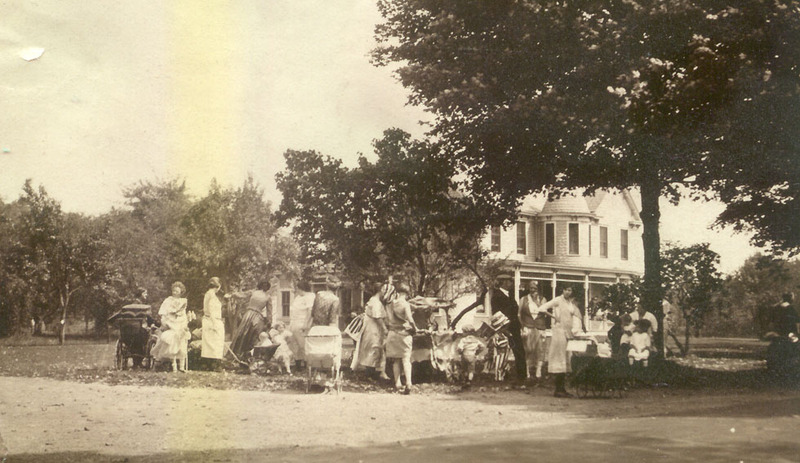 Located on Main Street in the Ledgewood NJ Drakesville Historic Park, the store was operated by Theodore F. King from 1874 through 1928 and was originally built in 1826. Theodore & Emma Riggs King built the adjacent Victorian House in 1881 and in 1883 welcomed their daughter Louise into the family. A restored Parlor and two Exhibition rooms are open to the public. This June 1917 photo shows a group of people on Main Street, Ledgewood, NJ gathered for 'Gala Day', an annual community-wide festival sponsored by Ledgewood Baptist Church. The 'Baby-Parade' was a prominent feature, and these families are ready to join the parade. Behind the group is the Theodore & Emma King Victorian Home, built in 1881 and now the "King Home Museum"
The 1881 King Home as it appeared in 2006, now undergoing restoration and operated as a Museum by the Roxbury Historic Trust. A newly restored Parlor and two Exhibition rooms are open to the public. One past Exhibit at the King Museum Homestead was entitled "Circa 1906", and displays furniture, clothing and decorative items found in homes 100 years ago. 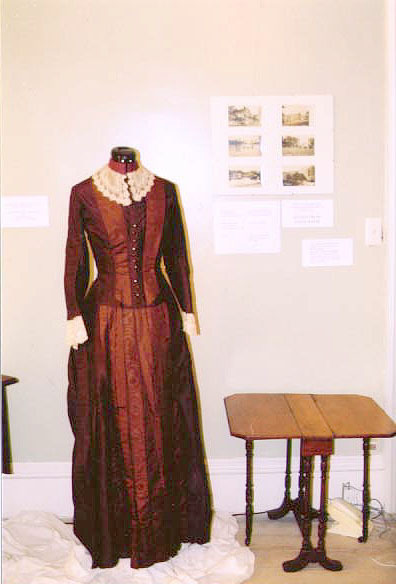 The maroon dress above would be typical of those worn to a formal occasion, such as a wedding, by a proper Lady. Part of the Exhibit at the King Museum Homestead. 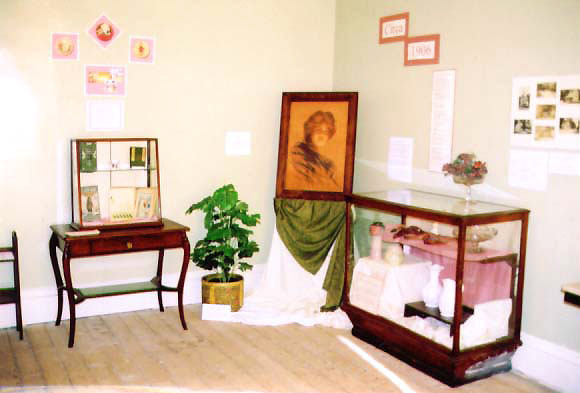 Display cases contain curios and artifacts of life 100 years ago, as well as a portrait of "Peggy", an illustration of the "new independent women" of the post-Victorian age. This nook on the second floor displays items familiar to children of 100 years ago, and still loved by children today, though we suspect made of different materials. 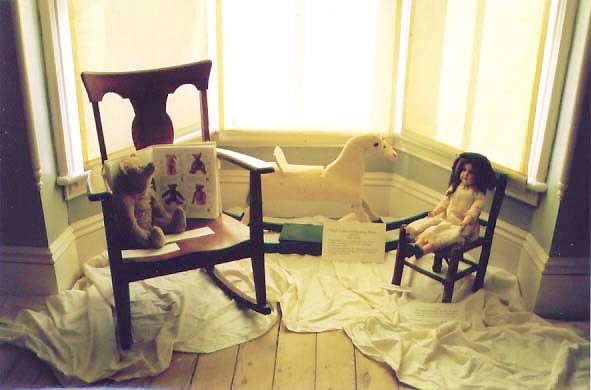 The Rocking Chair, Teddy Bear, Doll and Rocking Horse continue their timeless appeal. By 1887 the King Homestead shows up on Robinson's map. A vernacular frame house to start, this home has had several additions with Italianate and Queen Ann influenced detailing. It is possible that the original house may just have consisted of the current parlor, Exhibit Rooms 1 and 2, one or both staircases to the second floor, on which there were two front bedrooms (current RHT Office and Conference Room) and a smaller bedroom at the rear. There were stairs to the basement which contained the kitchen (basement kitchens were common in Victorian homes). The "dumb-waiter" was probably installed when the Dinning Room was added, so that food could be brought up from the kitchen below. The final additions to the home were probably the circular first floor office first used by Mr. King and then later by Louise King, and a rear first floor Kitchen. 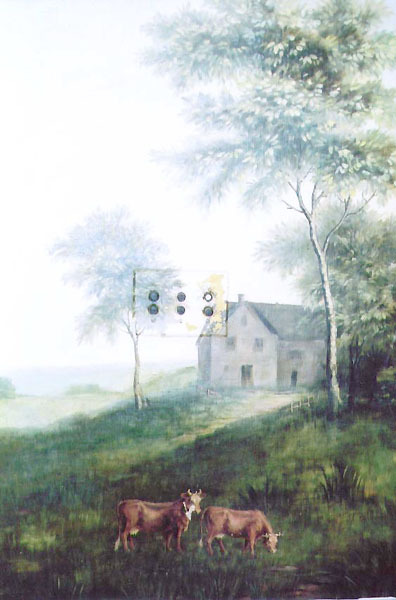 Of artistic interest is an unusual pastoral mural painted in 1936 by James W. Marland, in gratitude for King family hospitality. There are also remnants of shadow pictures of birds in the upstairs bathroom painted by him. - The Roxbury Rotary Club received permission to rehabilitate the Home in May of 2000. Structural rehabilitation is now nearing completion and the Roxbury Historic Trust, formed to maintain the buildings and the collections within, is concentrating on interior refurbishing and the presentation of educational exhibits. Silas Riggs Saltbox House. Please join us. NOTE: Can't make the scheduled opening?? ©2005-2018 Roxbury Historic Trust, Ledgewood, NJ. Please do not reproduce or use on another website without permission.